Territorial Cooperation Program Greece – Italy, 2007 – 2013 and co- financed by the European Union (ERDF) and by National Funds of Greece and Italy. The overall objective of the meeting was to enhance cooperation among the selected institutions of the two countries (Greece and Italy) towards facilitating the elaboration of historical buildings preservation methods and the implementation of policy guidelines. 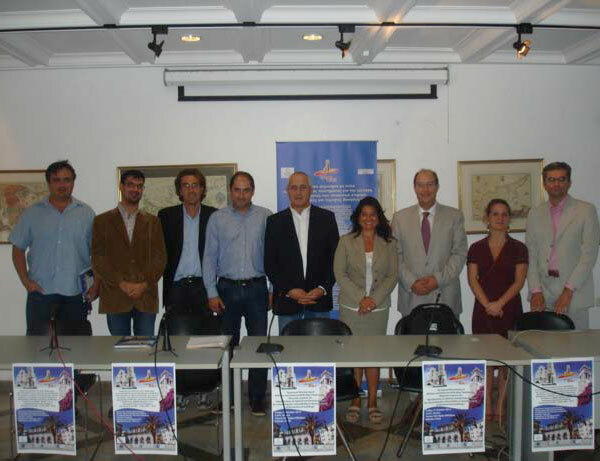 The specific objective of the joint thematic seminar was to present at the broad public the so far project’s results, especially for the developing monitoring system, and also to develop capacities with the Local Authorities to facilitate the implementation of historical buildings preservation methods, by increasing understating of the way that the available funding is distributing at local level. The event was organized by the Corfu Municipality Sole Shareholder Co. S.A.. It was held at the offices of the Company, Pyli Agiou Nikolaou, Faliraki, 49100 Corfu. At the beginning of the seminar, Mr George Mamalos (President of Boards of Directors of Corfu Municipality Sole Shareholder Co. S.A.) Prof. Vassilios Chrissicopoulos (Head of the Department of Informatics of Ionian University) provided a warm welcome to all seminar participants. Next, a number of speakers belonging to the project research team presented the scope and aims of the project, as well as the current progress and estimated perspectives. In Particular, Prof. Dora Foti, head of the project Leading Partner (Polytechnic of Bari) gave the seminar keynote speech entitled ‘S.M.ART. BUIL.T. – Project overview’. Next, Prof. Nicola Ivan Giannoccaro, Electronic Engineer, Professor at University of Salento presented his talk on ‘S.M.ART. BUIL.T. Technical aspects of modal parameters dynamic identification for interested buildings’. On behalf of Corfu Municipality, Mrs Mary Mitropia, Architecture, Head of Old City Office gave a presentation entitled ‘Historical Buildings of Corfu’, while Dr. Kostas Oikonomou, from Ionian University presented the S.M.ART. BUIL.T. wireless sensor network targeted to analysis and implementation of the actual building structural monitoring. The seminar concluded through a Questions and Answers session moderated by Prof. Dora Foti.